How many weeks pregnant: 37 weeks today! Belly Button - In/Out: In but it pokes out a bit, depending on where baby is. Cravings/Aversions: Cravings - ice cream and ice. Separately, not together. I also have been having dreams about food which either signals that I have a problem or just that pregnancy makes you have strange dreams. Last night's was about Dairy Queen. Sleep: Sleep is really hit or miss. It takes quite a bit to get comfortable and I've been finding myself getting about 3-4 decent hours of sleep at night, along with a few more that are just "okay." So needless to say I've been napping during the day when possible. Nesting: Not much nesting going on now. I do need to do some clothes sorting and dig out a few baby items but they're just in Zac's closet, so not too far away or in storage or anything. Weight Gain: I got weighed at my appointment last week and had actually lost a tiny bit of weight. The midwife thinks my body may just be leveling off on the weight gain since we're nearing the end. Movement: Lots. I've noticed some of a slowdown but this is still a very active baby! Gender: STILL A SURPRISE. Eventually I'll have something else to put here...when the baby is born! Best moment this week: Christmas with my kiddos. That's not baby-related at all but I so enjoy the holidays. I also enjoyed using a gift certificate today that my Mom got me quite awhile ago for a manicure and pedicure. Now I have pretty dark blue fingernails and toenails. Looking forward to: Planning, I suppose. I kept saying I was going to wait until after the holidays to finish planning and preparing for baby but I guess I didn't realize just how little time there would be, in the grand scheme of things. I don't have a TON to do or anything, I guess I was just thinking it was further away than it was. I told everyone baby would probably be born the end of January (since I've gone over the last two pregnancies) but I wonder if perhaps I have actually jinxed myself and if that will somehow make baby arrive early. We have our home visit with our midwife the week after next and will be finalizing all our plans for who will be here, when to call, preparing our home, etc. You are getting so close!! So excited for you!! That early/full term thing makes sense. I had never heard that before. My little girl was born at 38 weeks and we had to stay in hospital for a while. 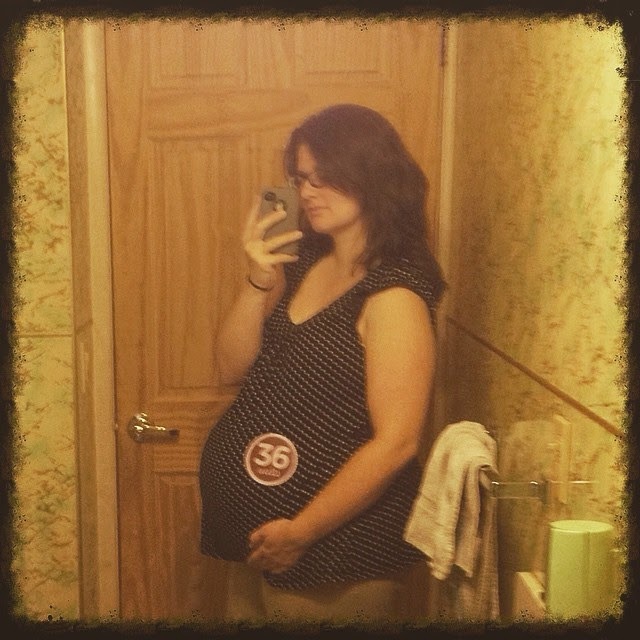 Wonder why everyone thinks full term is 37 weeks?? Hope your family has a Happy New Year!